Global ice-sheets are melting at an increased rate; Arctic sea-ice is disappearing much faster than recently projected, and future sea-level rise is now expected to be much higher than previously forecast, according to a new global scientific synthesis prepared by some of the world’s top climate scientists. 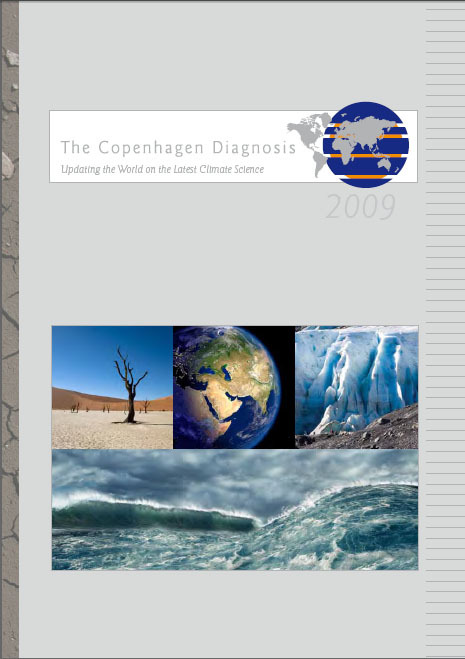 In a special report called ‘The Copenhagen Diagnosis’, the 26 researchers, most of whom are authors of published IPCC reports, conclude that several important aspects of climate change are occurring at the high end or even beyond the expectations of only a few years ago. The report also notes that global warming continues to track early IPCC projections based on greenhouse gas increases. Without significant mitigation, the report says global mean warming could reach as high as 7 degrees Celsius by 2100. The Copenhagen Diagnosis, which was a year in the making, documents the key findings in climate change science since the publication of the landmark Intergovernmental Panel on Climate Change (IPCC) Fourth Assessment Report in 2007. ・Satellite and direct measurements now demonstrate that both the Greenland and Antarctic ice-sheets are losing mass and contributing to sea level rise at an increasing rate.